China's coal imports hit a 23-month high of 26.97 million tonnes in November, up 24.96% from October and 66.56% from the year-ago level, showed data released by the General Administration of Customs (GAC) of China on December 8. That was the highest monthly imports since December 2014 when the country imported 27.22 million tonnes of coal, and the year-on-year growth in November was also the largest in 2016. Domestic prices rallied rapidly under the government's supply-side structural reform, which squeezed supply and left imported material with great price edge, thus boosting coal imports. The buying spree slowed in September and October, affected by released production at advanced coal mines and slack demand from downstream sectors. 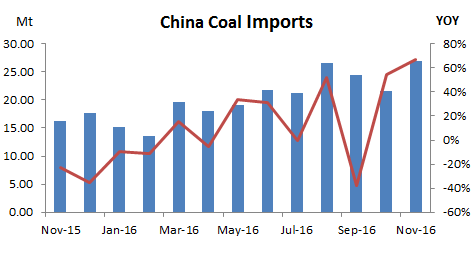 In November however, the country's coal imports rise with utilities replenishing stocks to cope with higher winter demand, amid northern China's heating season, as well as southern China's sliding temperature. The value of coal imports in November stood at $1.72 billion, surging 102.54% on year and up 31.44% on month. That translated to an average price of $63.85/t, rising $11.34/t on year and up $3.15/t from the previous month.